November, the month of crisp mornings full of the smell of wood smoke, collecting woollen scarves from the backs of cupboards, gingerbread lattes and the sudden panic of, oh crikey its Christmas next month! However positive my motivations I always find myself unprepared for buying presents and dreading the long queues in shops and floundering for ideas for the family gifts. Christmas shopping online or in store? For me, every year I shop online, no hesitation. You can make purchases in your own time, without being elbowed by harassed shoppers, find the best priced deals, get items gift wrapped and get ideas of what to buy from shops Christmas collections. You won’t find empty shelves and will avoid impulse buying. Google any product and you’re guaranteed to find thousands of reviews from past customers describing their experience with the company, shipping process and the product itself. I do suggest you don’t leave it last minute as the only downside is you have to wait for delivery and Royal Mail and the festive season can get very chaotic. The ideas for my gifts often stem from practicality, items that household love, especially when giving to adults. When I was a child socks and bubble bath would be a gift I would hate, now it’s one of my favourites. JML offer a one-stop holiday shop as there huge range of products will mean you can find everything on your list in one quick, CLICK. 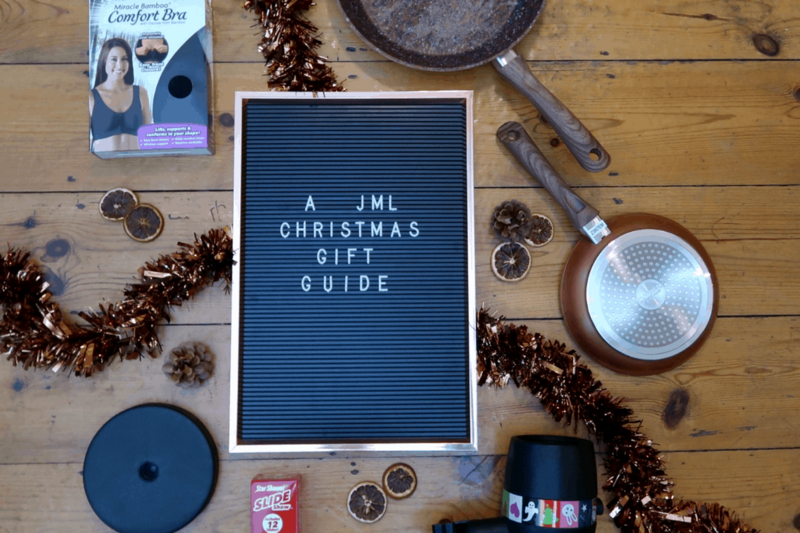 Don’t be lured into thinking JML is just kitchenware and cleaning products, their gift ideas section ranging for pets to kids has made my shopping experience easy! For the whole family to buy for pick the perfect stocking fillers from Mineral make up, Pixel watches to Build bonanza tape, so many options to make your loved ones smile on Christmas morning! Plus point there is also free delivery on order over £45. Here are just a couple of my favourite picks from the festive collection. For dad to cook up a storm this Christmas. The Copper Stone pans (£19.99-29.99) area perfect pick for my food loving other half. The tough, scratch resistant coating and steel base means they are built to last even my terrible cooking skills. Personally I love the copper colour base and smooth wooden effect handle. They are a good side and heat up quickly. The non-stick technology reducing the need for oils. For crazy children! Lights, noise and music! The Boppin Bugz game (£12.99) is perfect for my very lively six year old. You can buy one or all six characters to get the set. The motions sensors mean they avoid being caught and there are three different play modes. No board games for us this year! For mums who deserve comfort. At 6 months pregnant my choice this year is a super soft Miracle Bamboo Comfort Bra (£19.99). Its plus points are that it is wireless, has extra-large straps, removable inserts and is front fastening (which will be perfect for nursing). This and a foot rub and I will be merry! Ps. it is machine washable so no worrying about having to hand wash or fork out for fancy dry cleaning. JML also has a great collection of Christmas decorations for the home. Why not pick up this Star Shower Slideshow (£59.99) which can be used indoors and out to project snowmen, Christmas trees, presents on your walls. Children will love it and it definitely beats a boring bit of tinsel. (There are also slides for Halloween so this is a great all round buy!). Looking for something extra special to ‘WOW’ your neighbours this year? JML have kindly offered one lucky winner a Star Shower Lazer Magic decoration (£69.99) the laser light show that projects clear, bright festive images onto any wall. One UK winner will be drawn 48 hours after competition ends. If the winner does not respond in 72 hours another will be chosen. The competition will run from 13th-23rd November. The prize cannot be exchanged for an alternative item or monetary value. The dispatch of the prize is the responsibility of JML. JML have some of the most handy gadgets ever ! Not to mention some brilliantly fun ones like the hovering football light, my 5 kids had so much fun with it sliding it across the floor to see who could get it closest to a shoe ?